The party also made a volte face and included its founder Mulayam Singh Yadav's name in its list of "star campaigners", a day after leaving him out of it. 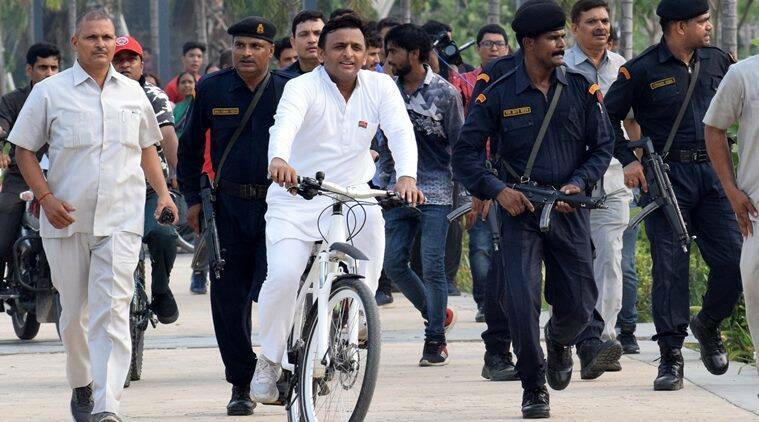 Samajwadi Party (SP) president and former Chief Minister Akhilesh Yadav will contest the Lok Sabha elections from Azamgarh, the party announced Sunday. Azam Khan, MLA from Rampur, will contest from Rampur Lok Sabha seat, it said. The party also made a volte face and included its founder Mulayam Singh Yadav’s name in its list of “star campaigners”, a day after leaving him out of it. The party’s list of 40 “star campaigners”, sent to the Election Commission Saturday, had no mention of the SP patriarch’s name. But the SP revised its list Sunday and mentioned Mulayam Singh Yadav’s name on the top of it before sending it to the poll panel. The revised list signed by senior SP leader Ram Gopal Yadav, besides including the party’s founders name, also carried the names of party chief Akhilesh Yadav, senior party leaders Azam Khan, Dimple Yadav and Jaya Bachchan among others. Ram Gopal Yadav too was enlisted as one of the “star campaigners.” Follow more election news here. The party has fielded Mulayam Singh Yadav from Mainpuri, considered as his home turf and “safest” one. The socialist stalwart presently represents Azamgarh Lok Sabha constituency, which he won in 2014 elections along with Mainpuri seat. He represented Mainpuri three times earlier in 1996, 2004 and 2009. The party, however, refused to comment on the first list that was circulated on social media. “We have issued a final list. Why should we talk about a list that we did not make public,” said Rajendra Choudhary, party spokesperson. A party source considered close to Akhilesh told The Indian Express that it is unlikely that Mulayam Singh Yadav will campaign for the upcoming polls. “He will most probably only go to file his nomination and will not campaign. It depends on him. If he wants to campaign, he will. Let us see what happens,” the source said on condition of anonymity. Mulayam recently said that he was not in favour of the alliance between SP and the Bahujan Samaj Party. “He (SP president Akhilesh Yadav) has forged an alliance with (BSP chief) Mayawati. got 40 out of 80 seats. My feeling is that about 25-26 seats may be won. Had Mulayam done that, it would not have happened. I would have objected then only,” Mulayam said in February.